Yongqun Guo（ 郭永群 ） was born in Sichuan, P. R. China. She got her BA in English from Chongqing University in 1983. In 1992 she moved to the United State where she was awarded her MS degree in Computer Science, and worked for five years in Seattle, Washington as a software Engineer. She uses long lasting ink colors extracted mostly from natural material. 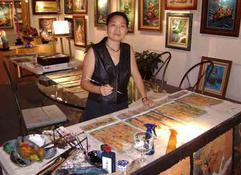 She paints on handmade paper and rice paper, which allows ink to soak through and become permenent. Once ink is dry the paintings is resistant to both moisture and sunlight. Yongqun （ 永群 ） always strives to leave open space for you to use your own imagination beyong te immediate impact of her brush strokes. Most of her paintings depict wind, rain, storm, and snow or the movement of animals driving, flying and running. She captures the essense of the objects, the mementary impression of it, but also strives to present its soul and feelings. She also uses oil on canvas. She often starts her paintings with no sketches or preconceived ideas. She allows the creative energy, colors and texture to natually develop as she paints. As straight lines, curves and colorful blocks are added, she embraces the joy and excitemet of the birth of each new painting.